Heidi Lewis Coleman will be exhibiting her Acrylic & Cut Paper piece, EQUINOX 2, in the National Association of Women Artist's upcoming show, WOMEN ARTISTS, COAST TO COAST: EAST at the Prince Street Gallery in New York City. This exciting national show was juried by Margaret O’Reilly, Executive Director and Curator of Fine Art, New Jersey State Museum, Trenton, NJ. 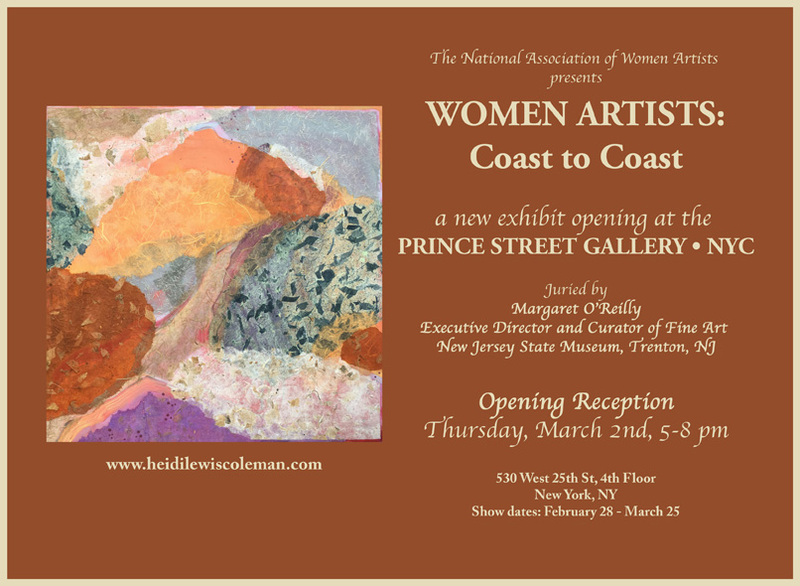 Please join us for the opening reception on Thursday, March 2nd, 5-8 PM. Show dates: 2/28 - 3/25. The Prince Street Gallery is located at 530 West 25th St, 4th Floor, New York, NY.